The badger (Taxidea taxus) is a stocky, medium-sized mammal with a broad head, a short, thick neck, short legs, and a short, bushy tail. Its front legs are stout and muscular, and its front claws are long. It is silver-gray, has long guard hairs, a black patch on each cheek, black feet, and a characteristic white stripe extending from its nose over the top of its head. The length of this stripe down the back varies. Badgers may weigh up to 30 pounds (13.5 kg), but average about 19 pounds (8.6 kg) for males and 14 pounds (6.3 kg) for females. Eye-shine at night is green. Badgers prefer open country with light to moderate cover, such as pastures and range-lands inhabited by burrowing rodents. They are seldom found in areas that have many trees. Badgers are opportunists, preying on ground-nesting birds and their eggs, mammals, reptiles, amphibians, and insects. Common dietary items are ground squirrels, pocket gophers, prairie dogs, and other smaller rodents. Occasionally they eat vegetable matter. Metabolism studies indicate that an average badger must eat about two ground squirrels or pocket gophers daily to maintain its weight. Badgers may occasionally kill small lambs and young domestic turkeys, parts of which they often will bury. Badgers are members of the weasel family and have the musky odor characteristic of this family. They are especially adapted for burrowing, with strong front legs equipped with long, well-developed claws. Their digging capability is used to pursue and capture ground-dwelling prey. Typical burrows dug in pursuit of prey are shallow and about 1 foot (30 cm) in diameter. 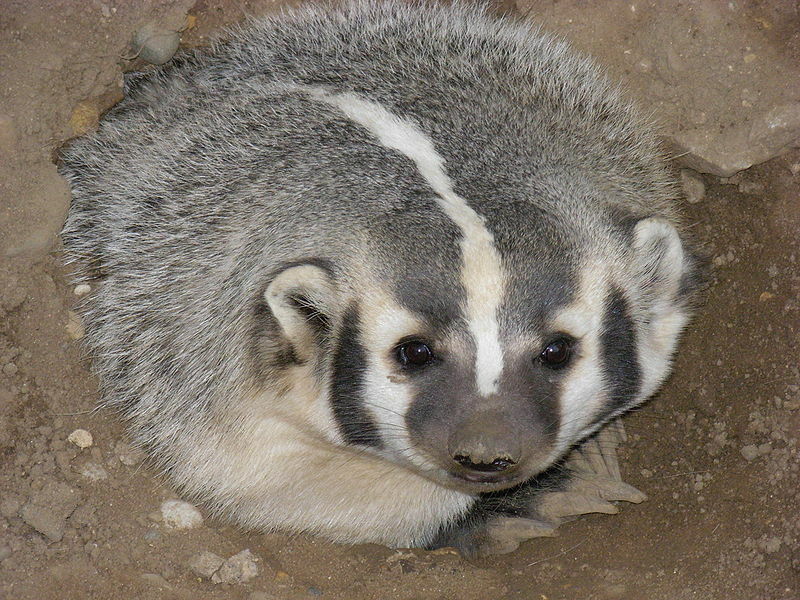 A female badger will dig a deeper burrow (5 to 30 feet long [1.5 to 9 m]) with an enlarged chamber 2 to 3 feet (0.6 to 0.9 m) below the surface in which to give birth. Dens usually have a single, often elliptical entrance, typically marked by a mound of soil in the front. Badgers have a rather ferocious appearance when confronted, and often make short charges at an intruder. They may hiss, growl, or snarl when fighting or cornered. Their quick movements, loose hide, muscular body, and tendency to retreat quickly into a den provide protection from most predators. Larger predators such as mountain lions, bears, and wolves will kill adult badgers. Coyotes and eagles will take young badgers. Badgers are active at night, remaining in dens during daylight hours, but are often seen at dawn or dusk. During winter they may remain inactive in their burrows for up to a month, although they are not true hibernators. Male badgers are solitary except during the mating season, and females are solitary except when mating or rearing young. Densities of badgers are reported to be about 1 per square mile (0.4/km 2) although densities as high as 5 to 15 badgers per square mile (1.9 to 5.8/km2) have been reported. An adult male’s home range may be as large as 2.5 square miles (6.5 km2); the home range of adult females is typically about half that size. Badgers may use as little as 10% of their range during the winter. be 15 1/2 years of age. Most damage caused by badgers results from their digging in pursuit of prey. Open burrows create a hazard to livestock and horseback riders. Badger diggings in crop fields may slow harvesting or cause damage to machinery. Digging can also damage earthen dams or dikes and irrigation canals, resulting in flooding and the loss of irrigation water. Diggings on the shoulders of roads can lead to erosion and the collapse of road surfaces. 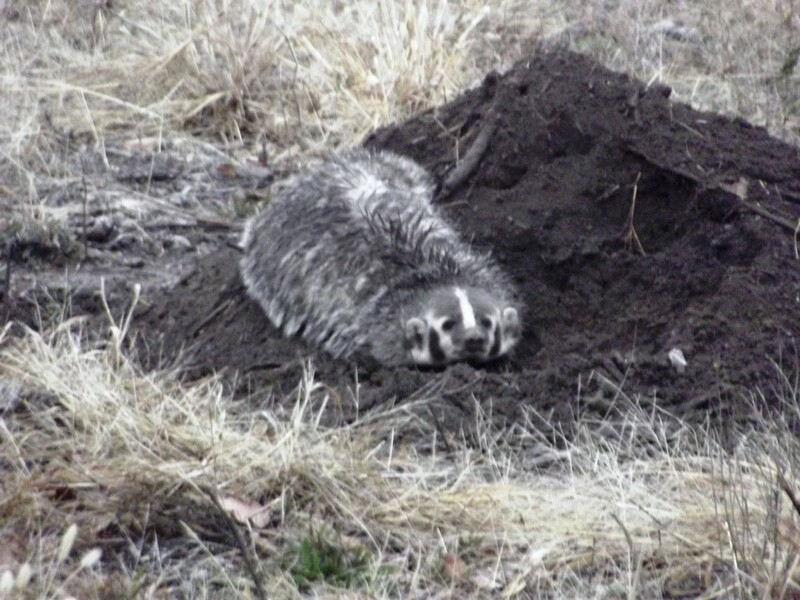 In late summer and fall, watch for signs of digging that indicate that young badgers have moved into the area. Badgers will occasionally prey on livestock or poultry, gaining access to protected animals by digging under fences or through the floor of a poultry house. Tracks can indicate the presence of badgers, but to the novice, badger tracks may appear similar to coyote tracks. Claw marks are farther from the toe pad in badger tracks, however, and the front tracks have a pigeon-toed appearance. Badgers usually consume all of a prairie dog except the head and the fur along the back. This characteristic probably holds true for much of their prey; however, signs of digging near the remains of prey are the best evidence of predation by a badger. Because badgers will kill black-footed ferrets, their presence is of concern in reintroduction programs for this endangered species. The Oklahoma Wildlife Control®, L.L.C., is a nuisance & predatory wildlife solutions and service company, with a number of specialties. However, OWC is not an animal rescue organization. If you have problems with domestic cats and dogs, we suggest that you contact your local animal shelter for assistance. Thank you.